Though Former Cricketer Aakash Chopra has written a book titled “Numbers Do Lie” but it is the only handy parameter to compare two players. 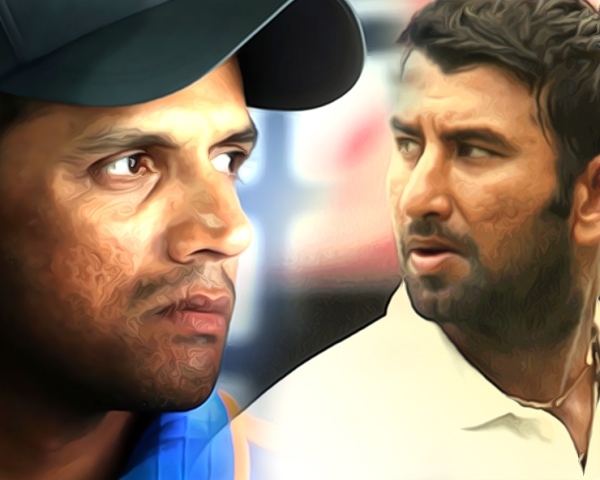 Cheteshwar Pujara is considered as a clone of Rahul Dravid. The reason being the stability he gives to the team in the batting order. He starts slowly, plays his shot when his eyes are set, reboots the innings when wickets at the other end fall in quick succession, everything is analogous to Rahul Dravid. If we Look at Rahul Dravid’s record, He has played 164 matches and scored 13,288 runs with an impressive average of 52.31. The wall has 36 hundred and 63 Fifties in his account. While Cheteshwar Pujara has appeared in 65 tests and scored 5,028 runs. The average of 50.28 is quite close to Dravid with 16 hundred’s and 19 fifties. But is it the same with the Overseas record? Rahul Dravid’s overseas performance was even better than his cumulative career, if the average is to go by. In 94 away tests Mr. reliable scored 7690 runs at an average of 53.03. Cheteshwar Pujara has a meagre average of 37.73 with 1811 runs in 28 matches. Given the sound technique and temperament, Pujara has not done justice with his talent in away tests. It looks like we are being unfair to Pujara by comparing his ongoing performance with the overall performance of Rahul Dravid “The Wall”. Thus, we have taken a sample size of first 69 test matches of Rahul Dravid which he completed in 2002. It will give a better insight into comparison. In the first six years, Dravid the wall had a staggering average of 57.23 in 38 test matches played in abroad. With 9 centuries and 16 fifties, he scored 3265 runs. Pujara’s overseas record doesn’t even get close to this one-third journey of Dravid’s test career. Not only the poor average of 37.73, The one down batsman has only 6 centuries and 5 fifties in his Kitty till date. If we look at the qualitative aspect of this comparison, Mr. Dependable faced bowlers like Glenn Mcgrath, Wasim Akram, Daren Gough, Chaminda Vaas, Shaun Pollack, Marvel Dhillon. Che has faced seaming conditions, but not the same quality of bowlers in his career so far. Cricket fans and experts often compare Cheteshwar Pujara with Rahul Dravid but the stats tell a different story altogether, especially in overseas conditions. The Inclusion of Cheteshwar Pujara in the white clothing was to make sure the damage control for the batting crumbles on green top pitches. As not only Che, probably every batsman contributes effortlessly including KL Rahul, Virat Kohli and Ajinkya Rahane In home conditions. Cheteshwar Pujara is a red ball specialist batsman, thus selectors expect him to score more often in windy conditions where other batsmen face chin music. The Saurashtra based batsman had a below average outing in the previous South Africa and England tour this year. In South Africa, he managed only one Fifty in 6 innings. While in 8 innings under English conditions he scored one Fifty and one Hundred. Thankfully, he has kicked off Australian tour with a ton, especially when India was in all sorts of trouble. Besides, he is on the verge of a fifty in the second innings. Pujara needs to continue his good run in away tests if he has to become the troubleshooter Rahul Dravid was in the late nineties and early twenties.